Fernando Cabada long-term goal is to represent the US at the 2016 Olympics in Rio de Janeiro, Brazil. He is a member of the Newton Running Elite team. He came to Pleasanton, California December 23, 2012 for one reason. He wanted to set the world Double Road Race record. That is what he did. He won both legs that day under challenging weather conditions. He won the 10k leg by 30 seconds and the field knew he was the one to beat. Fernando ran 30:31 for 10k. 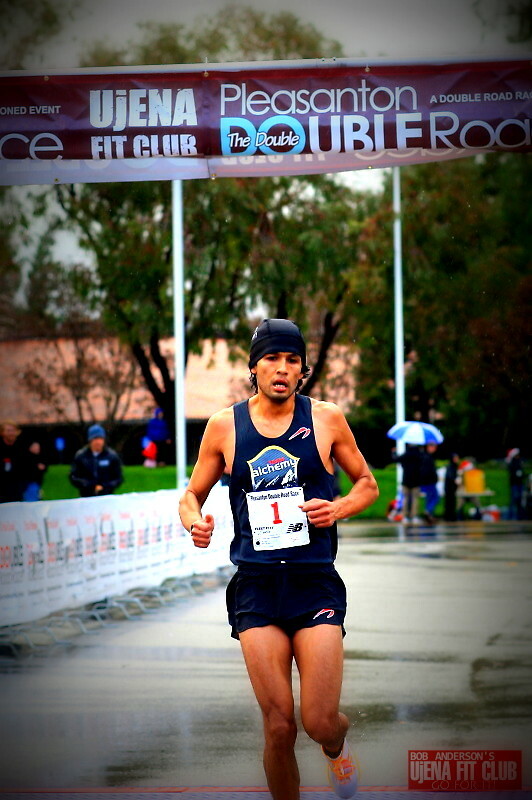 Daniel Tapia who finished second in the 10k knew he had to make up 30 seconds in the 5k leg. He went for it but Fernando stayed within striking distance. As they sprinted to the finished, Fernando pulled ahead by one second finishing in 15:02. Fernando's total time was 45:34, a new world record. The win was worth $500 plus a $500 bonus for the record. Cabada, who grew up amid gang culture and constant violence in his California neighborhood, chose at an early age to use his natural running talent as his vehicle for a better life. After a stand-out collegiate running career including seven track and cross country titles, he burst onto the elite American running scene in 2006 when he took the US 25k National Championship title in Grand Rapids Michigan in 1:14:21, breaking two-time Olympian Ed Eyestone's record by 17 seconds. This is an American record for that distance. He placed seventh at the US Olympic Trials in Houston in 2012 finishing in 2:11:53. He is running the Boston Marathon in 2013 and hopes to run a PR. Fernando is on top of the 2013 Double Road Race Leader board with 77 points after the first race of the season. (The Double season started December 23, 2012 in Pleasanton.) Good luck Fernando!